I love coming to this place. The food is decent and the beer is good. Service is iffy, but I'll put up with that to get a decent fresh beer in my hand. By iffy I mean that it depends on who you get for how quick and attentive they are. There are usually a good amount of beers on tap for a brewpub, 8-10 depending on the night, with a selection ranging from light to dark, malty to hoppy. They usually have a unique beer on tap that's not just the standard porter, for example. The food also has a good variety as well. You're covered if you want a salad or burger, or even something else. The nice thing about this place is it's also attached to a general store which has a good variety of beer as well from all over, not just what the brewery makes. With this being my first Review, I know I may not give a great input but I will stay within my means. I live about 10 minutes from this place its always a great place to go, good people, the beer is alright. But the best part about this place is the people and the fact that it is only 10 minutes away from my home. I feel that even the modest beers can be enjoyed greatly with the right people. This place also has a little shop connected to it and sells a lot of unusual stuff as well as some good bottled beers. Franklin's Restaurant, Brewery & General Store is a refreshing oasis for the beer enthusiast in search of bold new beers. Franklin's has an attached general store with enticing curiosities for all ages, including an extensive wine and beer section. I was thrilled to find many rare beers available for purchase by individual bottle. Franklin's 2-story restaurant has family dining downstairs, with colorful decor of yellow with red and blue trim. Food and service are satisfactory. Upstairs is a bar with TV, and their copper brew kettle. Franklin's 10 house beers can be purchased in a sampler, and span an impressive range from mild blonde and pale ales to robust stouts. They have interesting seasonals such as a pumpkin spice ale and a smoked rauchbier. My favorites were their double IPA (8.5% abv), imperial stout (9%), and English style old ale (9%). The only minor inconvenience was the pay parking (on weekdays), but I thoroughly enjoyed my visit to Franklin's. 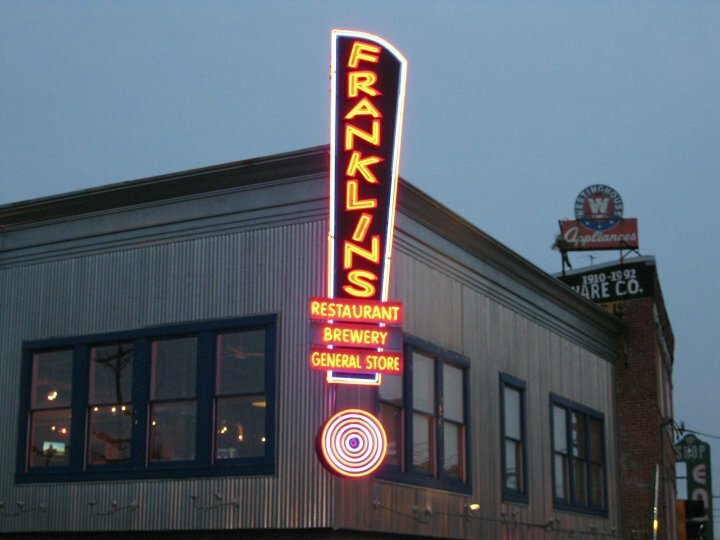 Franklin's is a different establishment than the one either of the earlier reviewers visited in 2007 or 2008. The food is really quite good now and - what's better - different than most pub food. For appetizers, it offers Thai Ribs (very spicy and tasty)and lamb 'sliders'. The prices are no higher than other non-fast food places in the area that serve food that doesn't take two seconds to cook. Most importantly, Franklin's recently changed its master brewer and - to me - he's improved on an already quality selection. Without question, the brew that stands out is the Hop Zen. It is 'hopped up', but still tastes very smooth. In addition, the interior of Franklin's is quirky and fun. It will now become a regular destination for us in the area... which we sorely lacking. Entrepreneurs take note: the University of Maryland's enormous 35,000-student flagship campus in College Park is surrounded by a vast craft-beer desert. Franklin's biggest draw is its brewpub-monopoly status over this perplexing local beer desert. Franklin's stronger beers typically have the beginner's homebrew tastes that I think come from transferring too much trub into the fermenter, fermenting warm and serving too soon after brew day. I've been homebrewing for a long time and I kind of like Franklin's muddy fusel-alcohol flavor flaws for nostalgia. The head brewer at another local brewpub described Franklin's head brewer as an "artist," who tends not to follow recipes. I don't think it was meant as a complement. Might be worth a stop if you like interesting, funky brews. But if you're looking for consistently clean-tasting beer this is not the place for you. Franklin's food is generally decent but way overpriced.